Good Morning Everyone! I hope you had a great weekend! Although we had rainy weather, I still got the chance to work in my garden. My Make It Monday share are these adorable Easter Bunnies created with the Stampin' Up! Treat Cups. Several versions are floating around on Pinterest, but I wanted to make my own for my students at school. I chose Pink Pirouette card stock for the girls and Soft Sky card stock for the boys. I then used various Stampin' Up! Punches to create the ears, body, and tail. 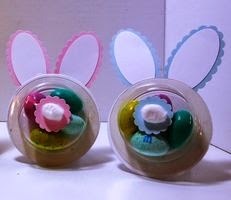 Because each cup comes with an adhesive backing, they were easy to fill with colorful Easter Candy. I think my students will be hopping down the bunny trail when they get them!